MARCH 2018 I DESIGN007 MAGAZINE 65 5 Mentor Launches HyperLynx Solution with Automated and Intelligent Channel Extraction for SERDES Interfaces E Mentor's new HyperLynx PCB simulation technology for high-performance designs now providing the industry's first end-to-end fully automated SERDES channel validation solu- tion. This is the industry's first fully automatic validation tool for PCB SERDES interfaces. 6 IoT: Let's Put the "A" Back into EDA E If I say IoT, most people today will immediately conjure up some notion in their mind. This is espe- cially true in the engineer- ing community, where many of us are hanging the future of our careers on the Utopian vision of a clean, beautiful environment with hidden networks and sen- sors everywhere. Whatever your viewpoint is, one thing is abundantly clear: there are going to be lots and lots and lots of PCBs made. 7 DfR Solutions Wins IPC APEX EXPO Innovation Award E DfR Solutions' newest version of its Sherlock Automated Design Analysis Software version 5.4 with tem- perature-based FEA has been awarded an IPC APEX EXPO Innovation Award. The award was presented to DfR Solutions at IPC APEX EXPO during John Mitchell's keynote speech. 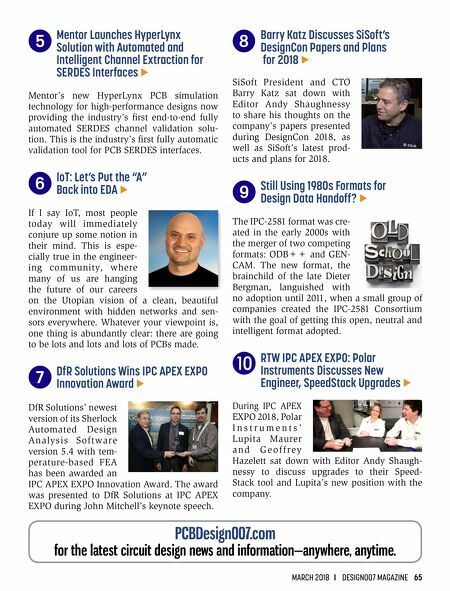 8 Barry Katz Discusses SiSoft's DesignCon Papers and Plans for 2018 E SiSoft President and CTO Barry Katz sat down with Editor Andy Shaughnessy to share his thoughts on the company's papers presented during DesignCon 2018, as well as SiSoft's latest prod- ucts and plans for 2018. 9 Still Using 1980s Formats for Design Data Handoff? E The IPC-2581 format was cre- ated in the early 2000s with the merger of two competing formats: ODB++ and GEN- CAM. The new format, the brainchild of the late Dieter Bergman, languished with no adoption until 2011, when a small group of companies created the IPC-2581 Consortium with the goal of getting this open, neutral and intelligent format adopted. J RTW IPC APEX EXPO: Polar Instruments Discusses New Engineer, SpeedStack Upgrades E During IPC APEX EXPO 2018, Polar I n s t r u m e n t s ' Lupita Maurer a n d G e o f f r e y Hazelett sat down with Editor Andy Shaugh- nessy to discuss upgrades to their Speed- Stack tool and Lupita's new position with the company. 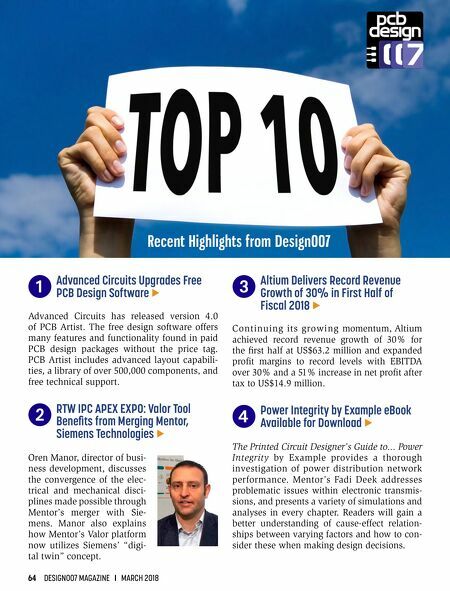 PCBDesign007.com for the latest circuit design news and information—anywhere, anytime. Feature Column — Will Cool Technology Attract the Next Generation of PCB Designers?